The Firing Squad™ - Motivation Specialists! Are your sales meetings starting to be repeats of everyone just getting together for the same old tired messages of “we have to do better?” …with the same old tired results to match? Well, to get “big” results, you need to wake up your meetings and conferences by bringing in the “big guns” with the terrible trio of the firm “Eastwood - Trump - Patton” The Firing Squad! Just like those “hammer them” law firm TV spots you see, The Firing Squad comes in like a hurricane, and not to intimidate your employees, no!…Their “mission” is to induce a rough-tough “take no prisoners” attitude in your employees towards your and their market competitors. It’s a pep rally, a show of mental force and fortitude, to “blast your competition into the dust!” That’s a winning warrior attitude! “Eastwood” comes in and shows everyone what real “gun control” (physical alertness) can do with trick shots and cool words on being “cool” under pressure. “Trump” brings a powerful profile in how to make better presentations, and make grand first impressions with customers and clients…(business decorum) in other words, talk the talk and walk the walk for winning new business! “Patton” gives the famous flag speech, but this time instead of the Nazi’s, he’s got your competitors in the cannon sights! ( fearless predator stalking the enemy ) Patton pulls no punches in the fight to ultimate victory in the market battlefields! 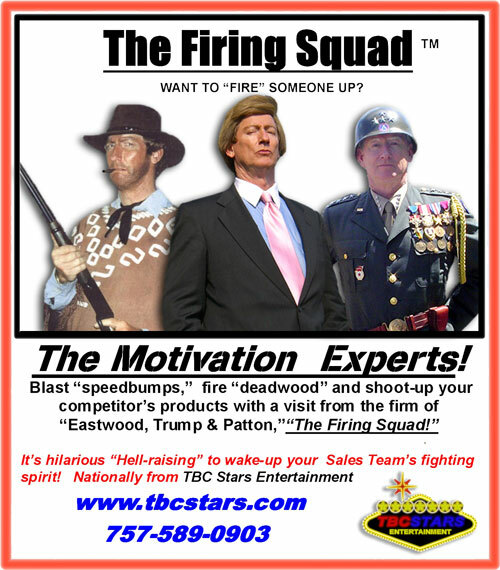 Let the ‘Firing Squad” fire up your employees with real fire power!